The tube containing the auger is referred to as BARREL and is most commonly manufactured by a spiral welding process. It might also be made by the “cut and shut” method where plate is rolled and then seam welded. Imported auger barrels may be made of ERW tube. 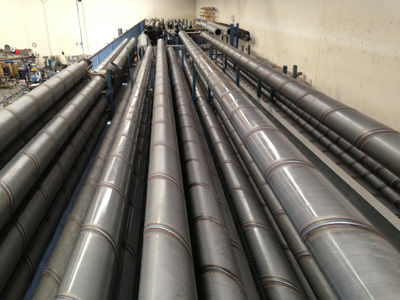 We manufacture Spiral Welded Tube in our factory and usually carry a generous amount of rolled stock in sizes from 4″ to 24″ available for dispatch same day. While it varies dependant on the time of year and volume of order, we normally roll to order within 2 to 5 days. CHECK OUT OUR NOTES BELOW TO HELP DETERMINE WHAT SIZE BARREL YOU REQUIRE & WHAT SIZES WE STOCK!! Old habits die hard and the older agricultural generation still “talk” imperial measurement for barrel diameter whilst the younger generation are all metric. All of our dies for making the spiral tube are Imperial ones so we normally “talk” inches as well. When replacing sections in old augers you need to accurately measure the outer diameter of the barrel. If you cannot directly measure across the end to get the outer diameter then measure the circumference. Wall thickness varies with our common sizes being 1.6mm, 1.8mm, 2mm, 2.5mm and 3mm. If we have the die to make the diameter size then a variety of wall thickness might be accommodated without too much trouble or expense. Mobile auger barrels of 9” and 10” diameter are usually of 2mm wall and are stocked in 45’ and 50’ lengths as well as the normal stock sizes. Field bin barrels are mostly of 2mm wall but can be 2.5mm for 15” diameter and up. Chaser bin barrels need to be more robust and are usually of 2.5mm wall or sometimes 3mm. WHAT ARE THE TUBES MADE OUT OF? Various forms of mild steel are used. We import a high tensile variety, the equivalent of Bluescope HA350 steel, which resists denting more and wears better than the cheaper types of steel commonly used. Galvanizing is achieved by the Hot-dipped process after the barrel is made. There are sometimes difficulties associated with the galvanizing process. Should you be considering galvanizing talk to us beforehand. Stainless steel can be made to order depending on quantities. WHAT LENGTH CAN I BUY? We carry a large range of barrel stock with lengths accordant to the type of auger being manufactured. Most spiral tube sizes are stocked in 3m, 6m and 12.2m lengths, however barrel for folding augers and field bins are sometimes stocked at different lengths. Realistically we can manufacture any length (up to 23m) with the most important consideration being transport to destination. It is best for you to tell us what length you actually require and then we will advise the closest length in stock. Every now and then you may get lucky with an offcut length. I CAN’T FIND MY SIZE ON THE LIST. CAN YOU MAKE A SPECIAL SIZE? Any size tube can be made but a die is required to correctly capture the outer diameter of the particular size. We have a variety of die sizes and make new ones as needed. The cost of these dies, compared to the amount of tube required, dictates if new ones are made. Usually we can provide what is required. CAN I PURCHASE BULK QUANTITIES? Yes. We offer discounts for customers purchasing in bulk. For more information on wholesale purchasing click here.